The first edition of Le Salon Du Chocolat, last weekend in Brussels was obviously something I couldn’t miss. In went in with high hopes of finding some special bars, but unfortunately the accent was on Belgian Chocolate. This means a lot of Belgian producers like Godiva, Callebaut, Leonidas and others were present. Their products appeal to the masses, but people like me, looking for bean to bar, high quality chocolate were left a bit in the dark. Luckely there were some highlights. I visited the stand of El Sauco, one of the distributers of various chocolate makers I adore. 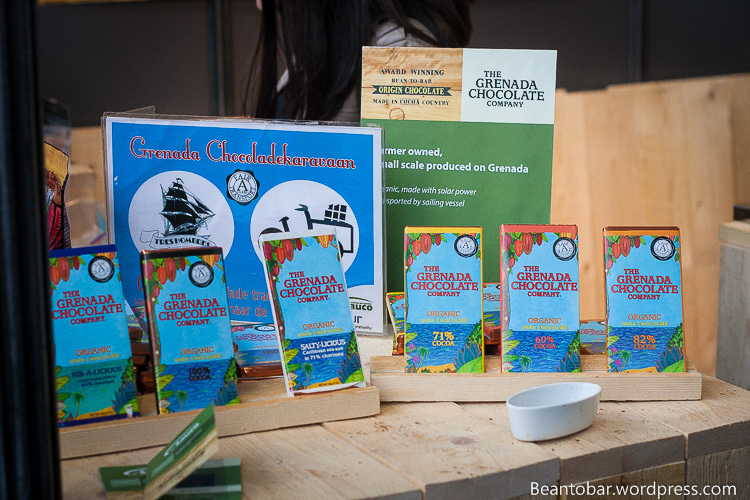 Marou, The Grenada Chocolate Company, Pacari. I had a very nice talk with Isabelle Quirynen of Bitterzoet Chocolade, who let me taste the Pacari Nube chocolate. An amazing piece, yet quiet costly. But quality has its price, especially in chocolate. 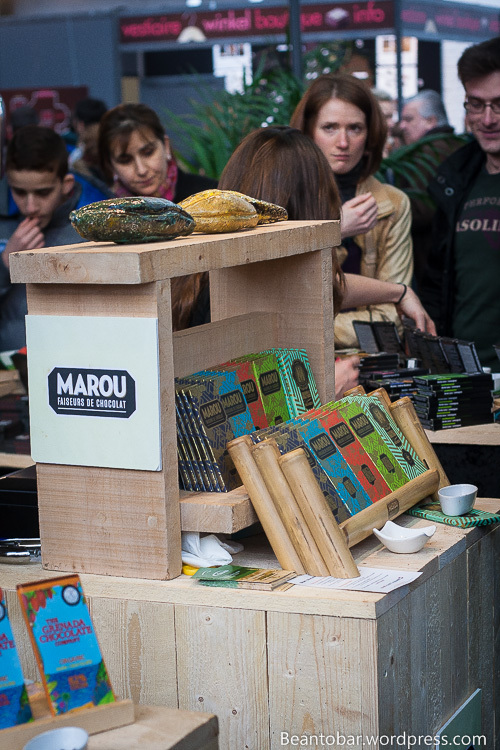 Next on the list was the wonderful stand of Pierre Marcolini. One of the two Belgian bean to bar producers. There was simply to much people around to get any decent photos, nor sample any of their creations. The sales lady had to leave the stand to get more tasting bars. Guess they were overwhelmed by the sheer number of visitors too. What I did get to experience, is the taste of a freshly roasted cacao bean. Pealed from its skin, it provided the taste of pure chocolate and wonderful nutty tones. Last visit of the fair, after crawling through thick packs of people, was the stand of Benoit Nihant. The second Belgian bean to bar producer. 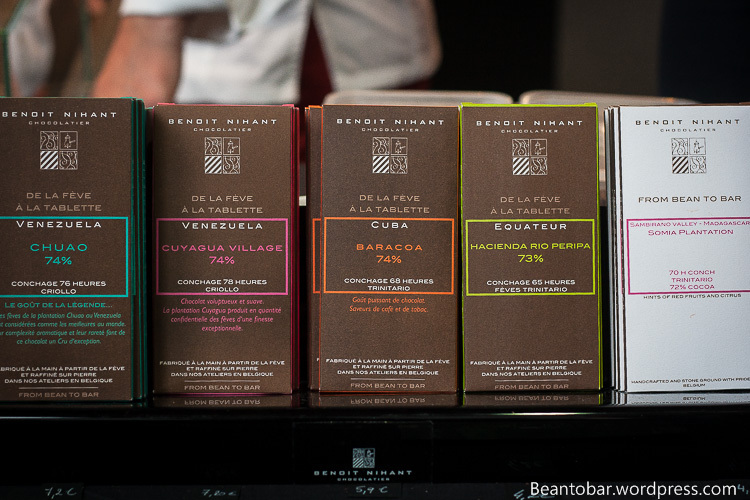 Monsieur Nihant was very occupied by explaining the wonders of his chocolate to the visitors, but I got to talk to his lovely wife, who organised a tasting session of their single origin bars on the spot, for myself and some other connoisseurs. I left the stand after purchasing his Madagascar bar. I went back to Marcolini to buy his version of Madagascan cacao. Soon I’ll do a double review on this terroir, comparing the results of the efforts two real Belgian Chocolate producers with one origin. I’m looking forward to that. I left the fair with mixed emotions. It is great to see such an attention for a nice product, yet somehow it misses the chance to teach the people about the really good stuff. I guess this is not the main objective of the fair, but it is a pity that the Dutch seem to be able to organise at least two events on quality chocolate (Chocoa and Origin Chocolate Event), while Belgium, the so-called country of chocolate has to do with a general fair, organised for the very first time. 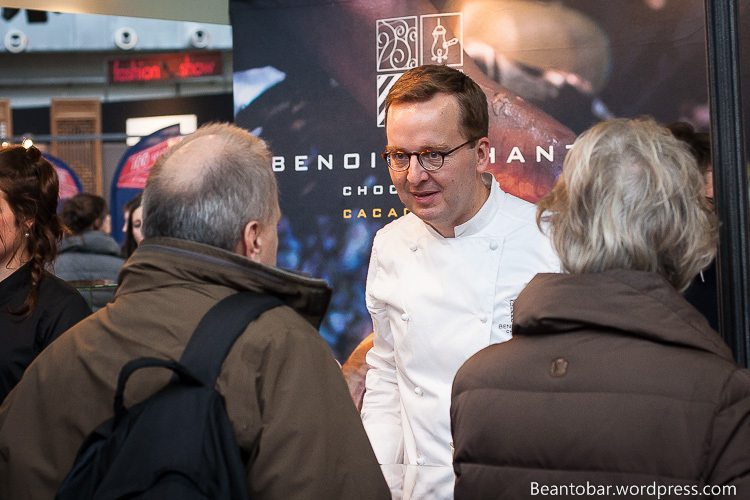 But hey, check out the website of Salon Du Chocolat – they organise fairs all over the world. Maybe the one near you will bring you more surprises!